The original Mayflower and its 102 passengers sailed from England to the New World in 1620. What became of those passengers has been well documented. But the ship itself? Not so much. Lost at sea? Sunk? Scuttled? Left to rot? All is left to conjecture. But, over 300 years later, in the mid-1950’s – after WWII and after a living history museum called Plimoth Plantation was established 3 miles from Plymouth MA harbor (in 1947), English journalist and PR Master, Warwick Charlton, had an idea to honor the close ties between England and the United States. He pushed to have a reproduction of the Mayflower built as a gift to America. (Though emblematic of merchant ships of the day, it is not an exact replica). With money raised by English schoolchildren, the Mayflower II came to fruition, and in 1957, sailed from Plymouth UK to Plymouth MA. To date, the ship has seen over 25 million visitors and is ready for a complete overhaul. Plimouth Plantation has much in common with Mystic Connecticut’s Mystic Seaport. 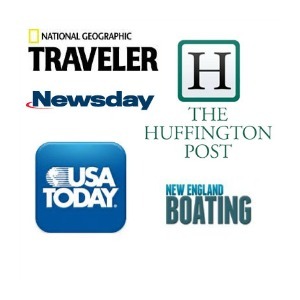 They are both “Living History” museums with strong public programming and educational components. And so, it was only natural for the Plantation to reach out to the Seaport – which is prominent in this esoteric field, having ten full time wooden boat restorers on staff – to lend some hands. Help bring the Mayflower II back to her original luster, and we’ll cross-promote both institutions: a classic win-win. 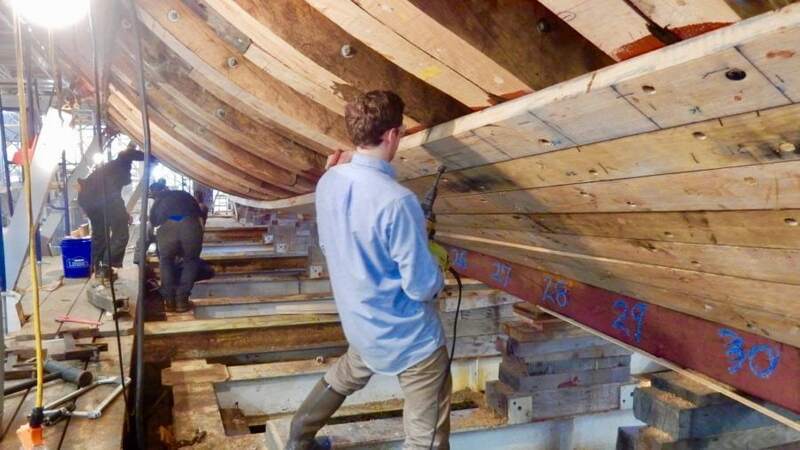 To that end, Mystic Seaport welcomed the Mayflower II on November 3, 2016, adding over 20 wooden boat tradesmen to its ten on staff, to work on replacing 60% of the ship’s interior and exterior planking. Directors anticipate that the restoration will be completed sometime in mid 2019, when Mayflower II will sail back to Plymouth MA in advance of the 400th Anniversary of the Mayflower’s landing in 1620. The 106 foot long, 25 foot wide, nearly 100-foot high ship now sits inside a massive heated tent within a complex set of girders and scaffolding, that in itself is a marvel of engineering. The process, though labor intensive and painstaking, is fascinating, especially since much of it is done authentically. Timber – mostly forms of live, White, and European Oak – has been sourced from all over the world. You can watch pieces as they are measured, shaved, and sanded in an enormous workshop. Each plank of wood destined for the hull or another curved surface is “cooked at 220 degrees” inside a “steam box” (an hour per inch thickness) to the point of flexibility – much as it was done by ship builders and coopers centuries ago. Shipwrights have 20-30 minutes before the wood stiffens up, so they must work quickly, literally putting their backs into it, as each plank is molded to the curvaceous hull frame (futtocks) and fastened with wooden trunnels – “tree nails” and galvanized spikes. Though mid-2019, visitors to Mystic Seaport will have the added benefit of watching this historic ship – the Mayflower II – as it undergoes restoration. It’s a once in a lifetime experience. For more to do at Mystic Seaport – or in Mystic CT, check out this Getaway Mavens Post.